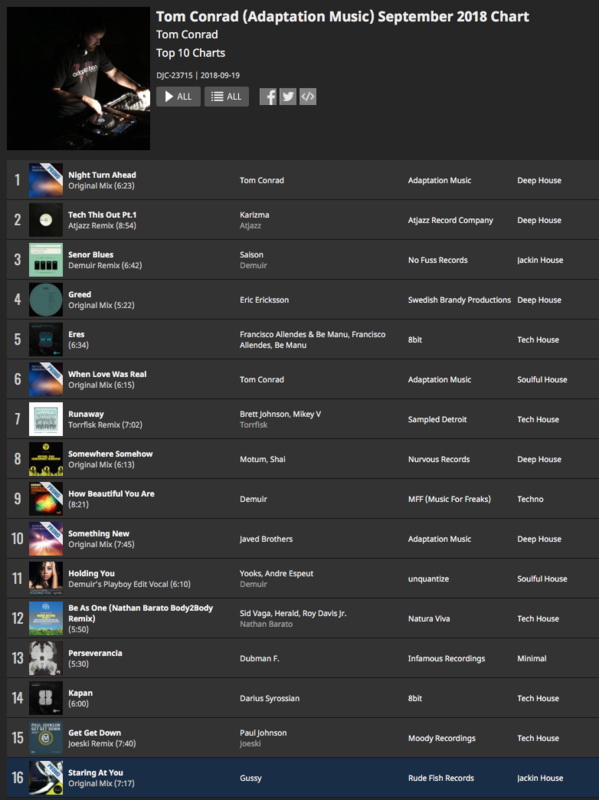 Adaptation Music’s Bonetti continues the new Perspectives series of compilations on Adaptation Music with his favourite selection from the label’s back catalogue including his brilliant originals ‘Happiness Is Freedom’ and ‘Lose My Mind’ both of which entered the Traxsource Deep House Top 20 when released. Track 1 Written, Arranged and Produced By Jay West. Remix and additional production By Pablo Fierro. Track 2 Written, Arranged and Produced By Soul De Marin. Track 3 Written, Arranged and Produced By Lonya Koval. Remix and additional production By Groove Assassin. Track 4 Written, Arranged and Produced By Tom Conrad. Track 5 Written, Arranged and Produced By D-Reflection & Sandy Spady. Remix and additional production By Ollie Viero. Track 6 Written, Arranged and Produced By Demarkus Lewis. Track 7 Written, Arranged and Produced By Tom Conrad. Track 8 Written, Arranged and Produced By Choopie & Segall. Track 9 Written, Arranged and Produced By Haldo. Remix and additional production By Black Sonix. Track 10 Written, Arranged and Produced By DJ Bee. Remix and additional production By Ricky Inch. Track 11 Written, Arranged and Produced By Tom Conrad & Carla Prather. Remix and additional production By Vick Lavender. Track 12 Written, Arranged and Produced By Soul De Marin. Track 13 Written, Arranged and Produced By Tom Conrad. Track 14 Written, Arranged and Produced By Yan Gordo. Track 15 Written, Arranged and Produced By Bonetti. Track 16 Written, Arranged and Produced By Bonetti. Track 18 Written, Arranged and Produced By Hamza. Track 19 Written, Arranged and Produced By Datakestra & Masahiro Suzuki. Track 20 Written, Arranged and Produced By Edmund & Sacha D’Flame. Remix and additional production By Kiko Navarro. Adaptation Music’s Tom Conrad’s latest EP showcases his versatility with the aptly titled ‘Variations EP’ following on from his recent ‘Summer Of 92 EP’ and release on U.S imprint King Street Sounds. First on the EP is ‘Night Turn Ahead’, a deep late night groove which is guaranteed to be a surefire hit with deep house fans and DJs alike due to its old school New York feel with infectious chords, tight percussion and neat synth work. On a totally different tip is the by no means ‘just a B side’ Balearic tinged track ‘When Love Was Real’ which combines garage style beats with soulful chords, old school synth sounds and an overall very catchy vibe. Is it Jackin House or Soulful House? You decide. This release is yet another strong EP from Tom Conrad on Adaptation in 2018 so watch this space as Tom continues to show his consistency and progression within the realms of deep and jackin underground house music. The latest Adaptation Music radio show and podcast showcases two hours of deep, tech and jackin house from Tom Conrad and top U.S west coast DJ and producer Arturo Garces. Music on the show comes from Tom Conrad, Huxley, Green Velvet, Demarkus Lewis and many more. Adaptation Music’s Tom Conrad releases another fine EP of old school influenced house music on the label, in the form of ‘Summer Of 92 EP’ following on from his recent ‘Affinity EP’ and a release on reputable big name U.S imprint King Street Sounds. First on the EP is ‘Deeper High’ with its infectious old school chords, Chicago style bass, funky marimba, soft horn sounds and atmospheric pads. Very Balearic and retro with a modern twist would be one way to describe the overall feel. The ‘B’ side to the EP ‘Look Back And Turn Around’ complements the other side well, with classic old school chords, funky New York style bassline and a sun soaked infectious groove. This release is the one of many on the way from Tom Conrad on Adaptation in 2018 so watch this space as Tom continues to show his consistency and progression within the realms of deep and jackin underground house music. The latest Adaptation Music radio show and podcast showcases two hours of deep, tech and jackin house from Tom Conrad and the super talented and prolific Tel Aviv DJ and producer Lonya. Music on the show comes from Demuir, Soledrifter, Joeski, Herve, Floorplan, El Funkador and many more.